Forthencho, the Lord of Admirals, was an ancient human senior naval officer who served during the human-Forerunner wars over nine thousand years before the Forerunner-Flood war. "Once, we were one great race, united in power and concerted in our goals..."
— Forthencho reminiscing humanity's age of flourish. As a high-ranking officer in the prehistoric human empire, Forthencho often found himself at odds with Yprin Yprikushma‎, humanity's Political and Morale Commander. He disputed Yprikushma's conclusion that Earth was humanity's original homeworld, having visited many worlds with ruins of a yet earlier human civilization preceding a technological dark age and believing that humanity's origins would be elsewhere. He also viewed Yprikushma's decision to bring the Primordial to Charum Hakkor as a grave mistake, arguing that the truths revealed by the Primordial in the subsequent interrogations demoralized humanity, contributing to their ultimate defeat against the Forerunners. During humanity's conflict with the Flood and their simultaneous war with the Forerunners, he attempted in vain to convince the human government to draw the Flood back into the galaxy as a weapon against the Forerunners. Ultimately, he was overruled by Yprin Yprikushma and remained bitter about the decision seeing the Flood could have been humanity's best hope of prolonging the war. 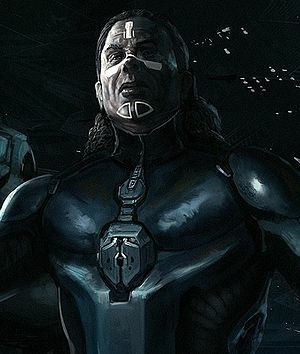 As humanity fell back to their capital world Charum Hakkor, Forthencho commanded the forces protecting the planet, gaining an intimate understanding of the Didact's tactics and strategy in the process of countering his constant assaults over the course of the final battle; he ironically stated that "no lover ever felt [his] attentions so fiercely." He later noted that despite his animosity toward Forerunners, he felt a deep respect for his main opponent. Eventually, he and the other surviving human forces were pushed back to the Precursor ruin known as Citadel Charum where they made their final stand. [note 1] As the final planetary defenses collapsed and their defeat became certain, the survivors stripped their uniforms in an effort to conceal their ranks from the Forerunners in the face of inevitable capture. This failed, as the Didact was able to locate him immediately from amongst the thousands of the human survivors that had been rounded up in the citadel. The Didact, accompanied by his wife, addresses a defeated Forthencho. Meeting his defeated opponent in person, the Didact addressed Forthencho as a fellow warrior, showing respect at his tenacity and reassuring him about the future, explaining that the Librarian had laid plans for Forthencho and his human fellows for thousands of years to come and that their impending death would not mean the end of humankind. The Forerunners' Old Council believed that humanity possessed a "cure" to the Flood, and the Librarian intended to use this belief to preserve what she could of the human survivors. First analyzed both physically and mentally in the most thorough ways possible, Forthencho and the other humans on Charum Hakkor were scanned by Composers, killing their physical selves but storing their patterns in virtual form. As mandated by the Old Council, the essences of Forthencho and the other humans processed by the Composer were splintered into many copies which were cycled through incessant virtual interrogation for thousands of years; the Council believed this would finally unlock humanity's supposed cure to the Flood thus making the Forerunners better prepared against the parasite when it reappeared. "Now that the Forerunners have succumbed, either in battle or from the Shaping Sickness, they have left behind just a few confused servants — and many, many humans, awaiting a new time, a new mandate. And that mandate is: avenge the fallen. Rise from defeat, rise from the dead! The promise is simple. Freedom. Support. Weapons unimagined in all our previous wars. Humans will fight Forerunners again—and defeat them!" — Forthencho's essence addresses his fellow humans after being extracted from Chakas. Over nine thousand years after his death, Forthencho's archived personality was implanted in the genetic material of a human known as Chakas via the Librarian's special geas. His memories began to surface in Chakas' mind after the young human witnessed the destruction of Charum Hakkor's Precursor artifacts and learned of the relocation of the Primordial, and his consciousness fully awakened after Chakas had crash-landed on Installation 07. Slowly becoming aware of his predicament and gaining strength within Chakas' mind, Forthencho would occasionally comment on the events around him, using his knowledge to enlighten Chakas on things beyond his understanding and often showing disappointment at how far humanity had fallen from their former glory. At one point, Chakas allowed Forthencho to take control of his body in order to converse with Yprin Yprikushma, whose consciousness was carried by Chakas' friend Riser. After being captured by Mendicant Bias, the rampant ancilla in control of the Halo, Forthencho's imprint was removed from Chakas and placed into a monitor shell; the same procedure was done to many other humans who also carried archived human memories. Mendicant Bias promised the ancient humans revenge on the Forerunners, if their former carriers cooperated with it in saving the Halo from an impending collision with a planet. Due to his hatred of the Forerunners and his desire for revenge, Forthencho was enthusiastic to accept Mendicant's offer; however, it is evident he was never truly in control and Mendicant Bias was only using him as a puppet to manipulate the humans into saving the ring. He gave a rousing speech to his resurrected comrades and planning that after saving the Halo, they could use it and Mendicant's vast resources to strike against the Forerunners. Chakas was hesitant to comply with this, even outright refusing, but Forthencho lied to Mendicant Bias that he had accepted. The plan ultimately failed as the IsoDidact's fleet retook Installation 07 soon after. Forthencho's imprint, along with many others, was eventually reunited with Chakas as his mind was used to create the monitor known as 343 Guilty Spark. While Chakas was still undergoing the conversion process, Forthencho's consciousness accompanied him and the IsoDidact as the latter interrogated the Primordial. Forthencho continued to exist within 343 Guilty Spark for the next 100,000 years; as Guilty Spark was being interrogated by a UNSC science team, Forthencho even managed to temporarily subsume the main data stream derived from Chakas' consciousness. Following the crash of the UNSC Rubicon on Geronos-a in 2554, Spark repaired, combined or jettisoned all of the personality streams inside of his mind until, by 2557, only Chakas and 343 Guilty Spark were left, marking the end of Forthencho's imprint. In September of that year, when Spark sought the help of an imprint of the Librarian beneath Mount Kilimanjaro to help him bring back Riser and Vinnevra, she reminded Spark of his own struggles containing Forthencho's essence and used it to help convince Spark to reconsider his plan. "The Halos will be fired. They are being fired. They have been fired!" — Forthencho's last words to the Librarian. By the end of the Forerunner-Flood war, the Gravemind had gained access to another copy of Forthencho's stored essence, along with those of three of his warriors. The Gravemind used these essences to deliver a message to the Librarian, who had deliberately stranded herself on Earth before the firing of the Halo Array. The essences were imprinted over human bodies, corrupted by the Flood in a way that they would rot the bodies from within, only allowing them to survive long enough to convey the Gravemind's message. The Gravemind told Forthencho of the extent of the Precursors' power, their history dating back billions of years, and the truth about the Domain as a Precursor creation to store all of their knowledge. While failing to understand or express a large portion of the sheer vastness of this knowledge, Forthencho conveyed the message to the Librarian to his best ability. The revelation led the Librarian to conclude that the Domain was in fact the mythical Organon, and that the activation of the Halo Array would destroy it along with all Precursor architecture. In his death throes, Forthencho grimaced, stating that there was no hope of stopping this, as the Halos had already been fired, though the pulse was yet to arrive in the system. Forthencho was dark-skinned and large in stature. He had broad shoulders; muscled, powerful arms and large hands with patches of hair, and a flat, broad head with a large square jaw. As was customary for human officers of his time, his face was adorned with several white markings. When represented as a hologram after his personality imprint was extracted from Chakas, he appeared wearing the traditional uniform of high-ranking human fleet commanders of his time, including a rounded helmet covering all but the forehead and the ears, a short coat worn over armor plating with a wide belt secured just below the chest. The uniform also included form-fitting pants and a bulky codpiece, which seemed "more than a little exaggerated" to Chakas. Check out our collection of quotes related to Forthencho in its quotes page. Considering his title, it is likely that the title of Lord of Admirals was the ancient human equivalent to the modern title of Chief of Naval Operations used by the United Nations Space Command. A younger Forthencho during humanity's conflict with the Flood. Forthencho examines a holographic readout of a Forerunner world for Flood infestation. Forthencho and Yprin Yprikushma in Halo Mythos. ↑ Terminal 4 of Halo 4 depicts the Didact's forces seizing Forthencho's flagship in orbit above Charum Hakkor and him personally surrendering to the Didact on the bridge.